She has been called “an energetic visionary” 3 Her work described as ”boldly express[ing] the porous borders of the visible and the invisible.” 8 Yet for such a renowned artist I found Susan Collett to be a quite shy and modest person. Susan Collett in her Toronto Studio. Susan Collett. Taking Work to the Museum, Fuping. 2007. Susan Collett. In Israel. 2009. Now fully confident Susan developed further residency opportunities. 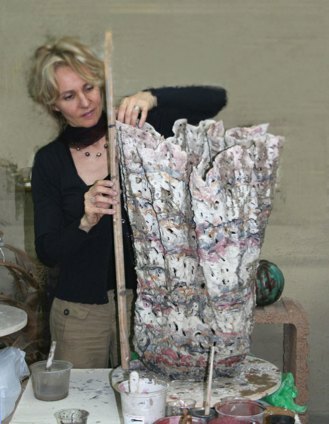 In 2009, she was invited by the by the Ceramic Artists Association of Israel and Binyamini Foundation for Ceramic Art to conduct a Master workshop near the Dead Sea.2 She has over her career exhibited Internationally, and nationally in public and private galleries, and has also completed large scale commission of sculpture and prints for hotel installations. 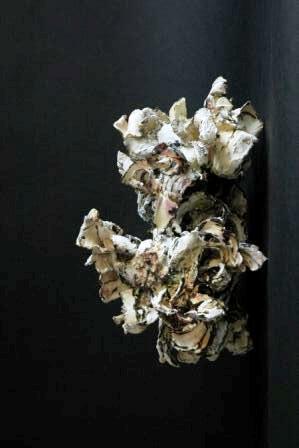 Susan has accepted invitations to give presentations on her work at The Gardiner Museum of Ceramic Art, Toronto, Hangzhou Art & Design Academy, China and Concordia University in Montreal among other places. 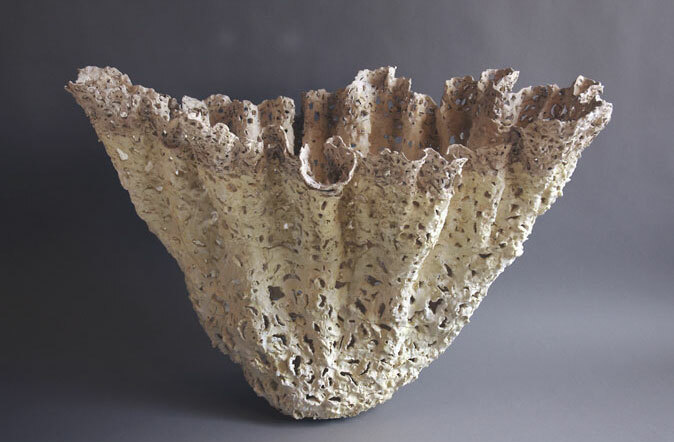 Her work was recently included in the Toronto International Art Fair 2013, Taiwan Biennale 2012, International Triennial of Silicate Arts, Kecskemet, Hungary 2011, Sevres Porcelain Museum, Paris, 2010, and an honourable mention at the CEBIKO International Ceramics Biennale in Korea 2009. 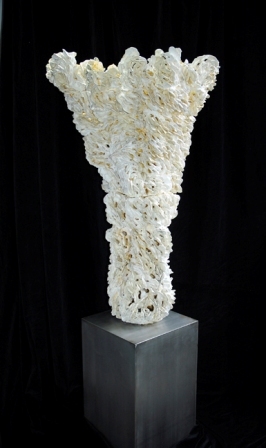 She has exhibited at SOFA Chicago, New York, and Palm Beach.2 Further recognition has been continuous. In 2007 she was elected to the International Academy of Ceramics; in 2008 she was elected to the Royal Canadian Academy of Art. Vessel Untitled 11989, 30″H x 25″W x 14″D, hand-built clay. This work from her early studio shows how far Susan has come in her explorations. In almost every way it is different from her later work. It is frontal, severely geometric, like an abstracted face, hearkening back to Cycladic styles of sculpture. Two extended wing-form handles, too fragile and planar to be functional, flank the central conical vessel. The surface is rough, like some long-buried archaeological patina, white with light blue encrustations. Already it is an art piece, non-functional. 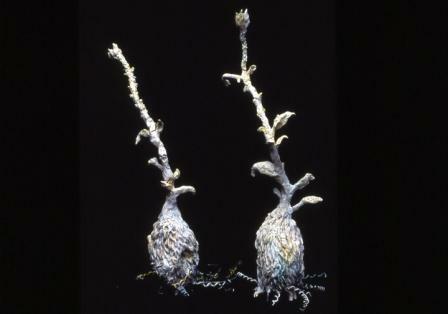 Seedling Pair 1993-95. 20″H x 8″W x 9″D. 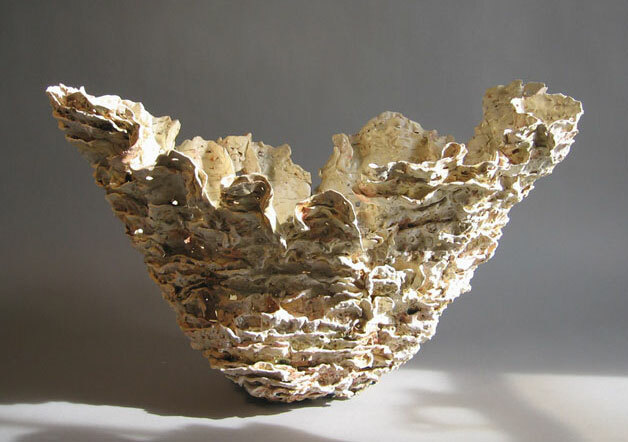 Another form of her early work is a dramatic move from her vessel ware. Here there is a quivering, compact, organic life force. She uses nichrome wire in the substructures. Strongly representational in general effect but strangely surreal because of its scale. Already Susan is exploring the questions of life and meaning. Such works show vulnerable emergence, the potential for new growth. Susan Collett. Folley on a Fountain. Part of the Impluvium Installation. 2006. Burlington Art Centre. Folley on a Fountain, 2006. 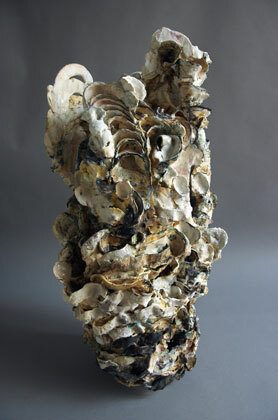 Susan would return much later to a similar organic form in her “Impluvium” exhibition at the Burlington Art Centre in 2006. Here the work “floats on a circular paving tile in the central pond that was filled with water; therefore, it looked like the piece was floating on water.”1 Like her later works this was made in sections, stacked and tabbed securely with copper strips. 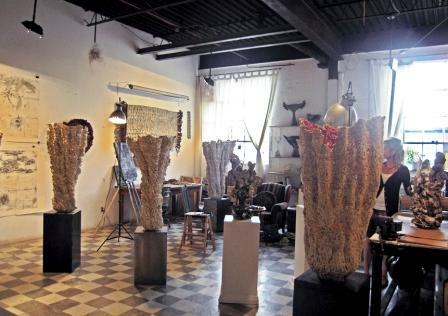 The use of metal wire, tabs or strips, is used throughout her career and her production including her later sculptures, prints and tiles, an example of how the prints feed the clay and vice versa. Susan Collett. Tile, Gladstone Hotel. 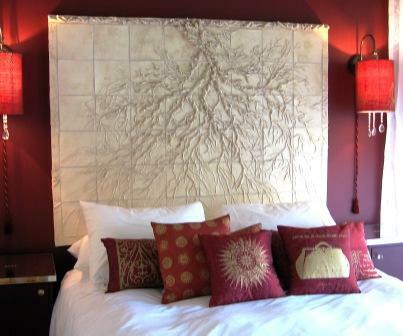 Gladstone Hotel, Tile Headboard, 2005. The prints and tiles display that ramifying complexity of flowing root, and branch. She acknowledges the interconnection between her media in imagery and technique. Just as importantly she would seek new techniques and media to achieve her vision. The development of her various series over the past dozen or so years show and interest in exploring scale and shape, surface and colour, warp and flow. 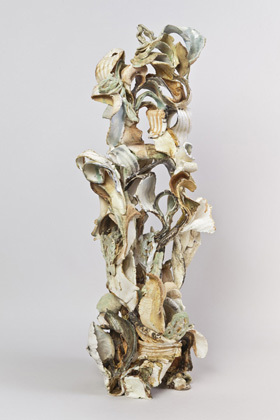 The result is several series of works that move from early “simple” organic vessel forms to almost rococo-like complex sculptures. These are works that stretch not only vertically but also reach out laterally in thin almost egg-shell like thickness, multi-fired to achieve a complex patina of surfaces. While her earlier works such as the Moiré or Labyrinth series still retain a vessel shape, her most recent series such as Maze and Maelstrom have lost the vessel connotation entirely. 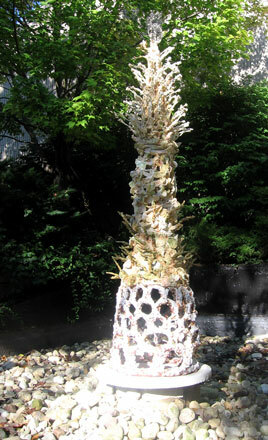 To create her perforations or holes she uses dentists tools and hollowed-out bamboo to remove plugs of material. 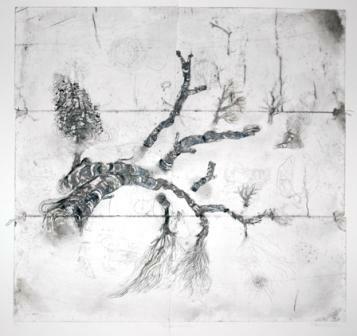 She then wires or clamps the segments together, a process she also uses in her printmaking.1 To further enhance the surface she incorporates glass that gives a winking or twinkling in the light, especially sunlight, aided by the movement of the observer. This, with her thin “porcelain-like” surfaces, results in a glowing from within. Light is as much an element as clay. A key determinant in her creation process is the size of her electric, top-loading kiln which is only 36” high. 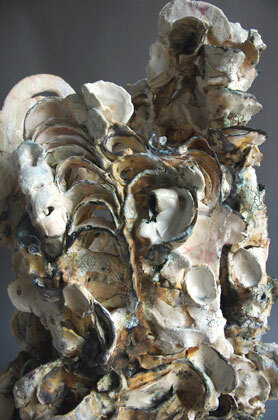 This requires her to make her sculptures in sections or layers in a succession of firings. The top section of each firing is then used as base for the next, each top becoming a template for the next firing. She fires about four or five “rings” or segments at a time so that each firing is one bisque ring with about three or four green rings. Finally, each fired segment is then wired or clamped to the others.1 Susan works with low temperature earthenware, firing to cone 03-06 to preserve colour. She also experiments by underfiring and overfiring. For colour she uses a paint-spray gun and brush, applying stains, glazes and engobes.1 As the various series progressed over the years she has introduced more colour into her work. Moiré is a reference to the effects created by overlaying similar but slightly off-kilter grids or patterns. Moire patterns shift and move in the light as the viewer’s perspective shifts. 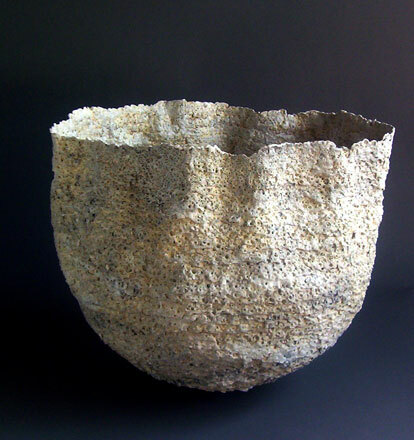 Susan uses the term as a metaphor for the undulating, shifting ceramic surfaces and light of this early series. Susan Collett. Moiré 1. Trump Hollywood Hotel. Yet Susan considers such marine associations incidental, not deliberate. She will admit to shopping for shells in the bookstore of the Royal Ontario Museum as a young girl, but not to purposefully reproducing forms from nature. Fan, Shale Series. 26”H x 36” x 19″. The Shale series begins to stretch the limits of unsupported surfaces and edges. The works are about the same size as the Moiré series but now Susan now moves away from the cylinder to a wider, flaring, inverted cone or trumpet shape. They are an early-stage essay into extending the limits of structure and support, strength and fragility. Susan Collett. Untitled, Shale Series 16” H x 27” x 13”. Untitled, Shale Series 16” H x 27” x 13”. Also in the Shale series Susan begins to play with the ruggedness or roughness of the surface, texturing it like some fossil encrustation. The lip or rim now loses the vessel “smoothness” and becomes more broken like some antique crenellation. The overall effect is one of “opening-up and out” rather than containment. Surfaces undulate but do not twist or spiral upwards. Labyrinth is her best well-known and documented series, and the most exhibited. The series coincides with further residencies, 2007 in Fuping, China, and 2009 in Israel. Impluvium. Installation. Burlington Art Centre from June 4 to September 17, 2006. Impluvium was the launch exhibition for this series and the directions that followed. 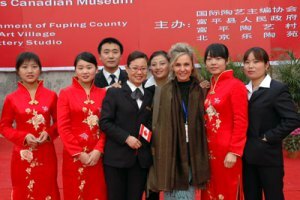 The exhibition shows the power of the China experience on Susan. 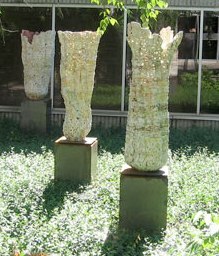 It was an external installation in the courtyard and brings her work literally out of the gallery and into a dynamic and potentially hostile, natural environment, as if to test their “strength and fragility.” Impluvium is a term for the rain water catch basin in the atrium of ancient Roman houses. These vessels are anything but holders of water. 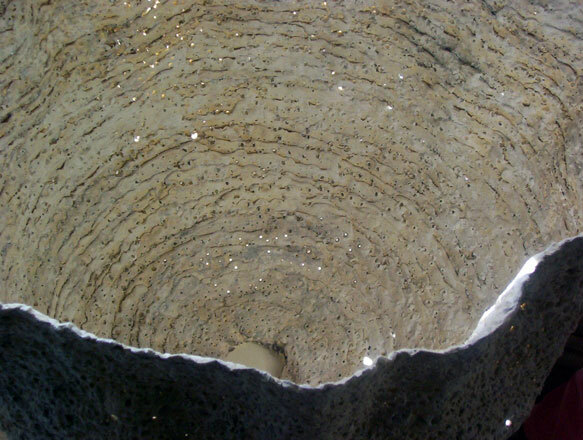 Rain water leaks and dribbles from the perforations and joints. Light is scattered and reflected from holes and across surfaces; glass was added to catch the sun’s daily movements. Each hour of each day the exhibition took on a different appearance. The exhibition lasted only three and a half months; it would have been interesting to witness a longer term contest between nature and art on the sculptures as seasonal rhythms and organic life forms came into play. Susan Collett. Trumpet, Labyrinth Series. 2006-12. 72”H on steel. Trumpet, Labryinth series. 2006-12. 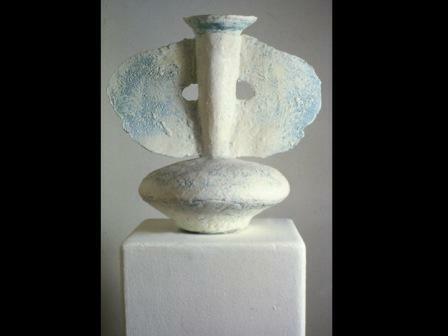 The series’ works became much taller more involuted with obvious vertical movement. The surface is an intaglio collection of curved and counter-curved channels and ridges, hand-made, squeezed and shaped, one layer upon the next. The line of movement is upwards in twists and spirals, reaching for some unknown life source The tops are again crenellated as they flare outwards in opposition to the works’ height. With the scale of the work itself and the steel plinth the viewer now comes into a different relationship with the work. Plinth and clay create a human scale, more fully sculptural, further reducing the vessels-origins. The scale of these works now actually requires attachment to a steel plinth. The use of metal clamps and wires to hold the sections together exposes the inherent vulnerability, the visual fragility of the structure. Susan Collett. Cavern 1 (Detail), Laurel Series. 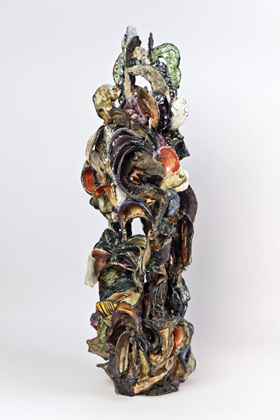 Cavern 1 (and detail), Laurel Series, 28″H x 14″W x 14″D. Laurel is a transitional series. 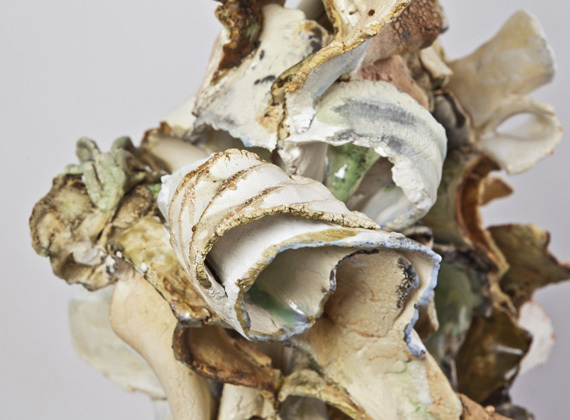 Susan is now using the paper clay to explore not just the limits of fragile form and the potential for collapse, but also the complexity of surface. She develops more obvious concavities with almost opalescent shell-like shapes and also adds ribbons of clay that emerge from the matrix as if raised by some buckling compression. The surface is now also more intensely coloured and tonal with stronger darks and lights. These dark colours add a solidity and weight not seen in earlier series. Susan Collett. Adage, Maze Series. 26″H x 9″W x 9″D. Susan Collett. Adage, Maze Series, Detail. Adage (and detail), Maze Series. 26″H x 9″W x 9″D. The Maze series continues the developments of the Laurel. There is a slight increase in size to 26″-30” The surfaces are now more looped in curls, open and coloured. They are the most intensely coloured to date. Architectural in effect with open loops and scrolls that flow and intertwine in blues and reds and yellows. The works are now open, penetrated not just punctured, with extensions out into the surrounding space. Space and clay become one as light plays off and defines glossy glaze, matte clay and sparkling glass. There are two types in the series: one rococo-like, with ribbons, lighter, airier, and open; the second is more baroque in look, denser and darker in form, with a chiaroscuro of tonal contrasts. Sonorous, Maze Series. 30″H x 10″W x 9″D. Sonorous is of the “baroque” genre. Such works are more deeply coloured, more vertical, penetrated, open, organically flowing. Dark surfaces and depths play off against intense primary colours. They rise, steeple-like, as though also inspired by some ecclesiastical invention. There is no longer a vessel connotation. The effect is more architectural. Unlike the Labyrinth series where light activates the work by small penetrations, light is now part of the solidity of the architecture, defining and moving through apertures, across swirls and deep into curls, reflecting off concavities. Holes now puncture the form, incorporating the spatial environment. Fraction, Maelstrom Series 2013. 13”H x 19”W x 12”D. Maelstrom continues the references in Susan’s earlier themes to life’s challenges in moiré patterns, mazes and labyrinths. Maelstrom suggests a state of confused movement, violent turmoil. The very word bespeaks the theme of chaos and beauty that Susan explored in her Maze series. This series achieves a solidity, a heaviness less apparent in former works. They are a bit smaller in dimension. Interestingly, the form is now horizontal. Works like Fraction are irregular clusters of off-balanced, stacked forms penetrating into the surrounding space. The effect is corroded, skeletal. All reference to a vessel is now gone. The play of light is now all external, surface, scattering across and penetrating down into curves and broken ribbons in an expressionistic movement. 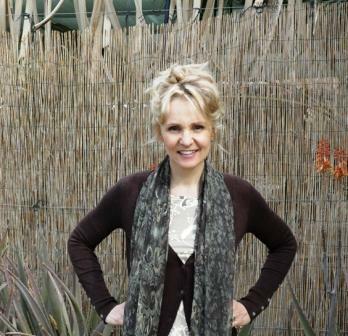 Interview with Susan Collett. A short interview where Susan describes her history and approach to her work. Produced to accompany the exhibition ‘The “C” Word: A Look at the Role of Craft in Contemporary Art’ at the Doris McCarthy Gallery, University of Toronto Scarborough (February 8 – April 4, 2012). 5:49 min. By the Doris McCarthy Gallery. February 8 – April 4, 2012). Susan Collett: Impluvium Courtyard Installation. A mood piece of her installation at the Burlington Art Centre; June to September 2006; a tour of the pieces with music background but no narration. 6:08 min. Camera and editing by Gregory Pilsworth. Sevres Porcelain Museum , Paris; International Ceramics Centre., Kecskemet, Hungary; Fule International, Canadian Museum, China; Icheon, Korea, World Ceramic Centre; Trump Tower Miami; Crown Collection Of The Official Residencies Of Canada Rideau Hall; Gardiner Museum Of Ceramic Art; Canadian Clay & Glass Gallery; Bata Shoe Museum Ernst & Young Canada; Queen Elizabeth Hotel (Montreal); Ontario Securities Commission; Kamm Collection, Los Angeles; Bank Of Montreal; Gladstone Hotel, Toronto; Burlington Art Centre, Four Seasons Hotel, Toronto, Vancouver. FuLe International Ceramic Art Museums (FLICAM), China’s first International Contemporary Ceramic Museum, Fuping, China. The Canadian Museum was opened in 2007. 1. Susan Collett. Interview and email correspondence with Barry Morrison. 3. Christian Bernard Singer. 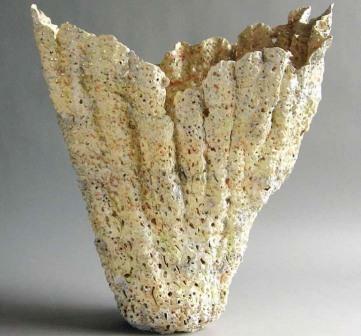 Clay and Glass Gallery: Susan Collett: New Works from the Permanent Collection. October 28, 2012 to March 17, 2013. 6. Tom Thomson Gallery: Talk. October 29 2008 – Talk at Tom Thomson Gallery. 8. Adina Balint-Babos. Susan Collett: Toronto Visual Artist. 2011-01-11. 9. Adina Balint-Babos .Figuration & Abstraction. Ceramic Review 250 July/August 2011. Pp 60-63 . This is great over view of Susan’s incredible ceramics and history! Congratulations! It’s nice to be referenced by other sites.